Have you ever wondered before why people unfollow you on Twitter? Well, I don't know whether you're here accidentally or may be you want to know the reason why you are being unfollowed by your Tweepers. I guess I could tell you the reasons exactly why you are losing them. This blog post is about the reasons why they follow you and then unfollow you. If you're a Twitter Addict, I can't say more than that you know, but may be the things that are stated below will help you not to lose your followers and be cautious about what you're doing the next time. A profile picture completes your Twitter profile even though there is no description on it. This is the first thing people notice in your profile. Most of the Twitter users uses automated follow tools to gain followers. When they follow you through any of these tools and chance of seeing your profile, if you don't have any profile pic, that's it. They unfollow you right on the way. Its all part of the twitter etiquette. You follow them, they follow you back. Mostly the ones they call themselves #TeamFollowBack. And when you unfollow them, they do the same. Usually, nobody's mistake here. May be you had seen any reason to unfollow them and they did the same too. So, why did you unfollow them? Any reason? This has always been the reason in most cases. It has been the reason for why your account gets suspended too. Spamming Direct Messages are sent to your followers without your consent in many cases. When your followers see one of the DM's they will always find a way to leave you so that they won't get into any trouble clicking your spams. We all know that when someone follow you back, their twitter stream is filled with your tweets. So, when you tweet any abusive tweets or any irrelevant tweets, it's natural that he/she will unfollow you. Besides, Twitter is a common medium anyway nobody cares what you had for breakfast and what you did in your bathroom!! These spamming tweets from your account are due to some reasons like when you use some unrecognized tools to gain followers and they tweet irrelevant links. Some are may be when your account got hacked by any media and they misuse your profile. But anyhow, when your followers see these spamming links in your tweets, they unfollow you no sooner. People do mention their special Tweet Friends on Twitter occasionally to remind them and keep in touch. Usually, the conversation goes on between only two guys and there are 4 or 5 other mentions too. Others get irritated to be a part of a conversation that is vague. They unfollow you or sometimes they may even block you at their extreme. There are some kinds of followers who follow your first and then after a few days you've followed them back, they flush out their following's list to keep up with their follower's list. These kinds of people will unfollow mostly to make their profile seem like maintaining a low following list with high followers. Why is the reason they follow you then? This is one of the main reasons why most of the people unfollow you. People on Twitter always maintains their following list to be atleast 1% minimum than their followers list. There are tools that help them find out their followers who are not been to twitter for more than a month or two. They will flush you out if you are in the group of people who are not there for a long time. There is no surprise you are unfollowed by your fellow tweepers in this case. So, you're new to Twitter and haven't tweeted anything of your own yet. Still you use tools to gain followers and the only tweets in your profile are auto-tweets. When any of your follower would like to see your profile and all they can see is your auto-tweets and none of your own. They will unfollow you. It's not their fault. People won't have to follow you unless you do something that is special or atleast relevant. 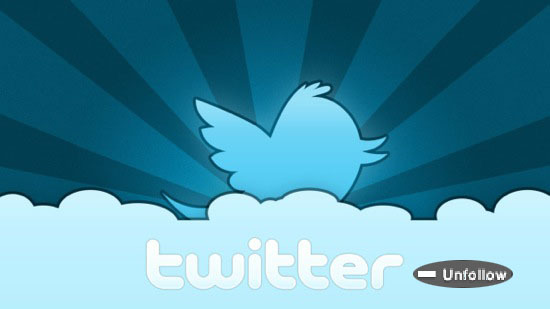 Afterall, Twitter is a place to tweet anything that you want. Like I said, Twitter is a place where you can tweet anything that you want and nobody cares. Well, you can make it helpful to others by tweeting something that may be useful to your followers in atleast one way that will also help you to increase your followers list and also reduce the rate of your unfollows. Thank you for telling me about this. Good stuff but one more. If. You’re not engaging and don’t talk to people every once in awhile, especially if they try to talk to you, you will probably be unfollowed as well. Yeah, You are right..Interaction is important every once in a while. Thanks for adding this one here. Not all users are capable of communicating people in the right way. Some people uses twitter for personal and businesses. For businesses interaction is very important to them so obviously they won't do anything stupid to make one possible customer to Un-follow them. Whilst, for personal usage, some individual uses twitter just to get notice. Posting non-sense things just to get comments and likes. That's what I've observed for the past couple months of using twitter.